So your little girl is getting married, and you have to give the father of the bride speech. During this important moment, it’s up to you to help usher her into this new life. The father of the bride has a number of responsibilities to attend to while preparing for the wedding. In addition to helping to pay for the wedding, helping with various details, and walking your daughter down the aisle, you’ll also have to prepare for the father of the bride speech. Although there are a million things going on before the wedding, preparing the father of the bride speech is definitely one of the most important tasks. As a father, it’s understandable to have a lot of different emotions swirling around during this period of your life. Your daughter has always been your little girl, and now this wedding, in a way, signifies that she is no longer that little girl you once knew. Even though you’re happy your daughter is getting married, part of you feels sad for your loss. Use this abundancy of emotion to construct your speech. Don’t sit down at the last minute to write your father of the bride speech. Give yourself a couple of weeks to figure it out. This’ll give you enough time to figure out everything you want to say. Do you want the speech to be light hearted and humorous, or deep and heartfelt? Do you want to talk about the time you shared with your daughter up to this moment, or more about the way you felt when you found out your daughter was taking this step? It might be a good idea to mix it up a little, and try hitting on a number of topics. You can deliver a heartfelt speech that expresses your love and support for your daughter and the groom, while delivering a couple of light hearted jokes in the process. Let your daughter know how much you love and care for her. Talk about how you’ve watched her grow up, and become the woman she is today. When mentioning your soon-to-be son-in-law, let him know how happy you are for him and your daughter. It’s important that the groom knows you accept him. Make it very clear that you consider him apart of your family. If you do decide to add a little humor in the mix, make sure it won’t be too embarrassing for either the bride and groom. When it comes to telling jokes during your father of the bride speech, a little self deprecation can add a nice touch. This kind of humor lets guests know you’re okay with this special moment, and you want everyone to have a fun time. If you’ve never had to give a father of the bride speech before, or you’re not a great public speaker, having butterflies in your stomach is expected. You don’t have to go directly into the core of your speech. Start off by welcoming everyone to the wedding, and thank everyone for coming to support your son-in-law and daughter on their special day. This should help you ease into your official speech. With the wide variety of Mother of the Bride dresses that are out there, it can be hard to find the right one that flatters your figure, blends well with the wedding party, and fits your budget as well. Let’s be honest, it’s quite a tall order to meet all those parameters, especially if your dress will need to be tailored to meet unusual specifications. Many women find it easier to simply buy something off the rack at one of the major department stores, but on such a special occasion you should have something is unique and created to your exact preferences, even though it can a time consuming and sometimes pricey prospect. Fortunately, it’s not an impossible task as long as you have the right tools and the right approach. Before beginning your search for Mother of the Bride dresses, it’s essential that you take the time to create a plan of action to help make the process easier. If you just go out shopping, you’re going to become discouraged very quickly and end up buying a dress that is just average, not stunning. Think first and foremost about the design and scheme of your daughter’s wedding, including the primary colors. While you certainly don’t want to match your outfit to the outfits of the Bridesmaids and groomsmen, it’s nice to choose a color that complement the colors of the wedding party. It’s important, too, to consider the time of day that the wedding is taking place; late morning and afternoon weddings are more relaxed and casual than evening affairs, which tend to be very formal. A daytime wedding is best suited for Mother of the Bride dresses that are lighter in color: Buff, beige, and blush are all popular and attractive colors that are almost universally flattering to just about every complexion. 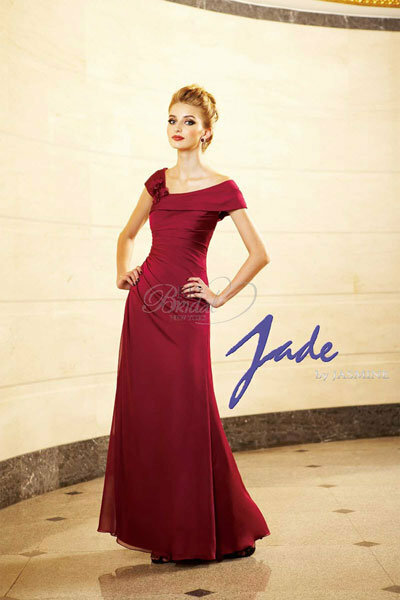 For an evening ceremony, you can go darker and more dramatic with deep jewel tones like ruby or sapphire. The important thing to remember is that your dress should be tasteful and appropriate so that the attention is on the newlyweds. Once you’ve found a gown that meets your sartorial requirements and looks good on your figure, it’s time to wrap it up and take it to a tailor who can customize it to your body. This is what truly make a dress stand apart from the crowd, and the expense is minimal. Even inexpensive clothes look high quality when they are tailored to the person wearing them, so forty or fifty dollars in tailoring your Mother of the Bride dress is money well spent.